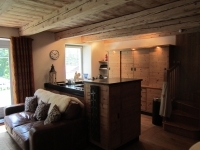 Ski Chalet to rent. Ski & Snowboard Chalet in Le Molliet, Sixt fer a Cheval. Samoens, Grand Massif. "Got to say those seven days were a dream. I really apprciated the off piste and coaching. The Chalet was top decked out in all the essential gear. I met some incredible people. Your company was second to none. 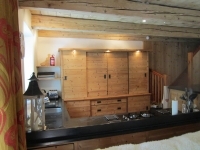 Much respect........." (R McC)"
This is a great "ski chalet" for rent. 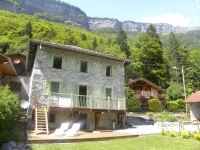 With oustanding views overlooking the river Giffre and the Cross Country Ski piste which runs from Samoens to the Fer a Cheval. A pretty, stone built, former village primary school. 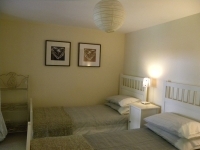 Providing wonderful rental accommodation for up to 8 people. Listed as one of the best places to stay in the Alps in summer by The Guardian.Click here to follow the link. Full of character and recently renovated to a very high standard. 5 minutes drive from Sixt Fer a Cheval, 10 minutes drive from the Grand Massif Express lift (GME). Guests will need their own transport to access the skiing area. Four bedrooms - 2 king size doubles - one with bath and hand basin ensuite; 2 twins - one with shower, hand basin and WC en-suite, the other with shower and hand basin. A beautifully equipped kitchen with granite work surfaces, gas hob, combi oven/microwave, separate oven, dishwasher, fridge and freezer. 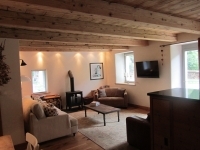 A delightful sitting room with wonderfully comfortable sofas and a woodburning stove (logs included). A glass door leads on to a balcony to the front of the house. WIFI, TV (FreeSat), DVD, CD system and a selection of games and books. Washing machine & dryer, iron and ironing board. Garden furniture and BBQ for use during the summer months. Ski Cave for all equipment, outdoor clothing, boot rack etc. Open fronted garage, parking for one vehicle with off road pull-in for a second vehicle.